One of the benefits of cooking on the barbecue circuit are the gifts you receive from friends. I have received bottles of sauce and rubs, fire starters, BBQ smoking frogmats, acrylic Weber kettle key chains, and a cherished 30 year old bag of Kingsford charcoal. Among the best gifts are invitations to events. 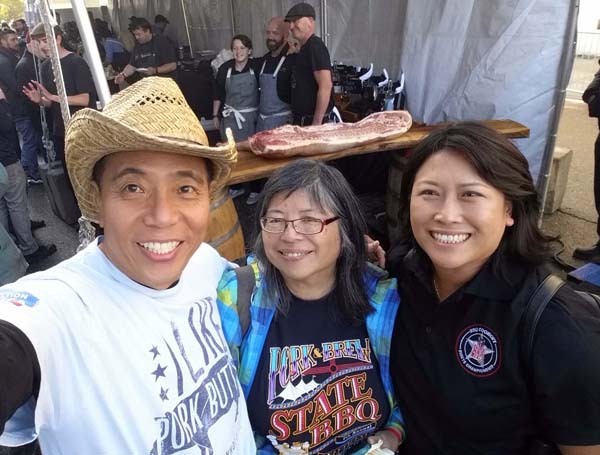 My friend, Melanie Wong who is a master BBQ judge and sometime assistant cook, invited Harry and me to Cochon 555 in San Francisco. I knew what the Grand Cochon was because the head of my department at Roche has a daughter who won the prestigious pig competition, Duskie Estes. Duskie and her husband, John Stewart, were crowned the Queen and King of Porc in 2011 (yes, it’s Porc). 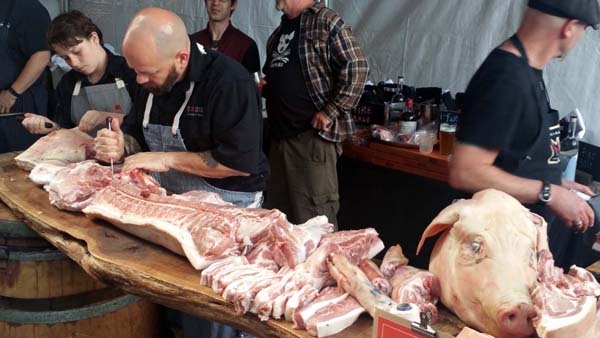 Cochon 555 is a pop-up tasting event featuring five chefs cooking five heritage breed pigs. There’s actually 14 chefs overall but only 5 of them competed to become the next Princess or Prince of Porc. The winner of this event moves on to the final round in Aspen. The event celebrates local family farms, heritage breed pigs and raises money for Piggy Bank, a 501(c)(3) charity. The tour moves through 10 cities in one year and ended here in San Francisco. Melanie introduced Harry and me to her friend Laiko Bahrs also known as the SFFoodGal and owner at Good Food Communications. 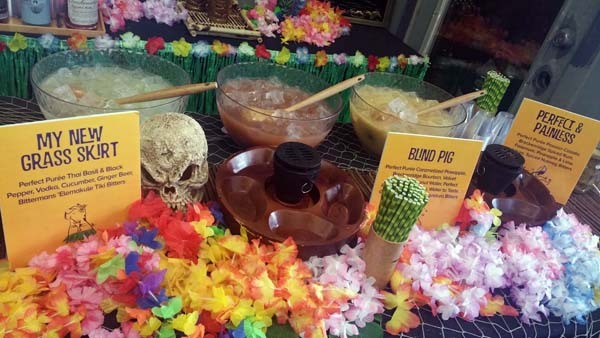 She has been working with Cochon for years and described the nature of the event and what it was trying to achieve. As it so happens, the founder of Cochon 555 was just behind us so we met Brad Lowe. Brad, the owner of Cochon told us how it works. Each chef is given a heritage hog weighing from 180-220 pounds and one week to prepare for the contest. Salumi is out of the question but the field was open otherwise. They are expected to create 6 separate dishes from head to tail. Each has to capture a different aspect of preparation. Outside of the competition, there were other additional chefs who were also preparing dishes that represented different countries like Cajun (Levi Mezick), Vietnamese (Tu David Phu), Philippines (Francis Ang), USA (Mark Dommen), China (Matthew Grigg), global (David Zboray) and Korean (Robin Song). Thankfully, Jennifer Nguyen of the Native Baking Company was present to represent swine sweets to give proper closure to a fine meal. 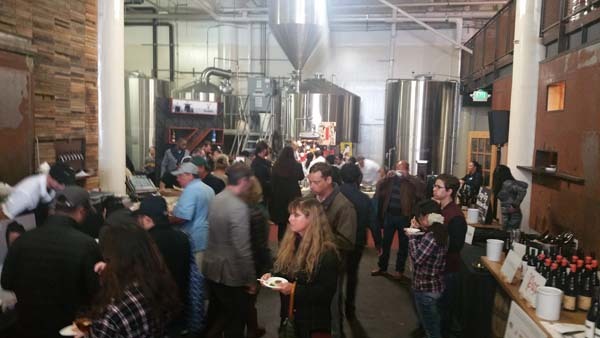 Along with the chefs, there are butchers, winemakers, bar keepers, craft brewers and distillers. 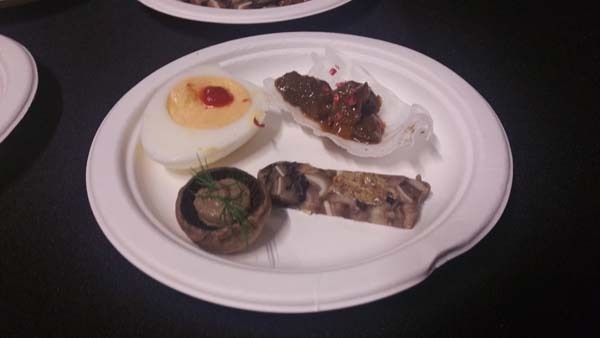 What’s fun about attending is not just eating beautifully prepared food in small bites but associating the flavor and texture I experience with a breed of pig and its farm. In today’s commodity market, this is a rare perspective. So here were the chefs who cooked for us. 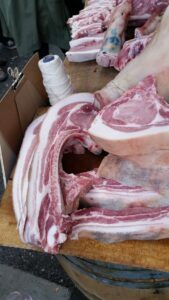 Brandon Korf of Smokestack got an old spot/Berkshire hog from DG Langley Farms. 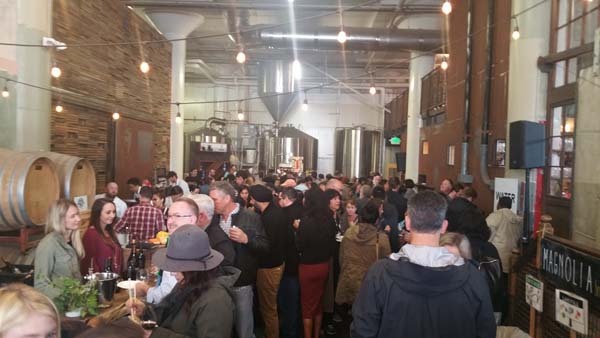 Chef Korf recently joined Magnolia Brewing’s Dogpatch taproom where the event was held to lead the fast-casual barbecue operation within Magnolia. I tasted a nice sauced sausage on skewer. Sophina Uong, winner of Chopped Grillmaster Napa, got a Mangalista hog from Winkler Farms. 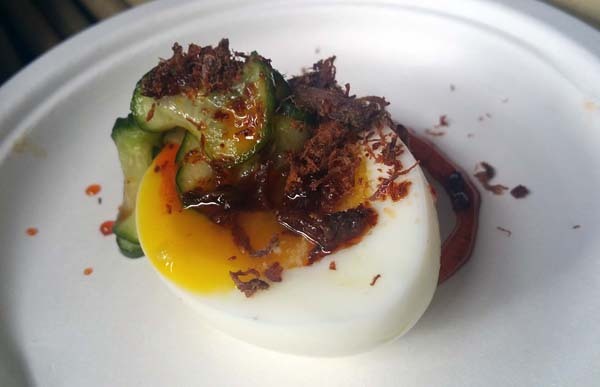 She made this amazing soft boiled egg topped with pork floss and picked cucumber. I congratulated her on her victory. She had a good vibe, confident and comfortable in her element. I can’t wait to see where she goes. 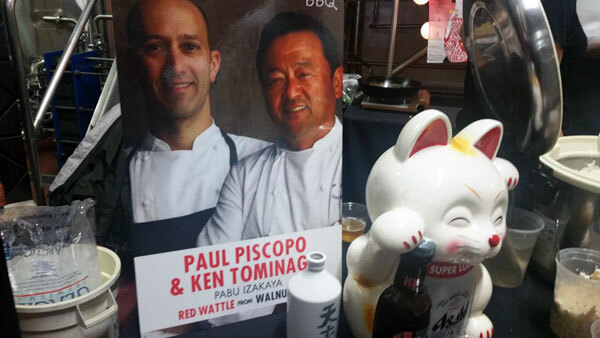 Paul Piscopo and Ken Tominaga of Pabu Izakaya, got a red wattle from Walnut Keep. The red wattles are finished on a diet of walnuts which give them a rich fatty quality. The richness was clear in the sausage they served. 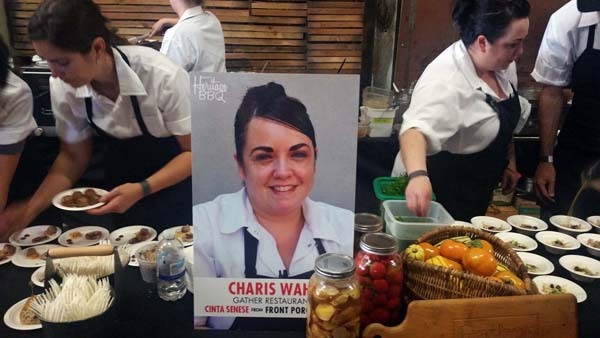 Charis Wahl of Gather restaurant got a Cinta Senese hog from Front Porch Farm. Chef Wahl became the new chef last spring. I hadn’t the opportunity to revisit Gather since her arrival but if her plates are representative of her work, I should go soon. There was banh mi sandwich. 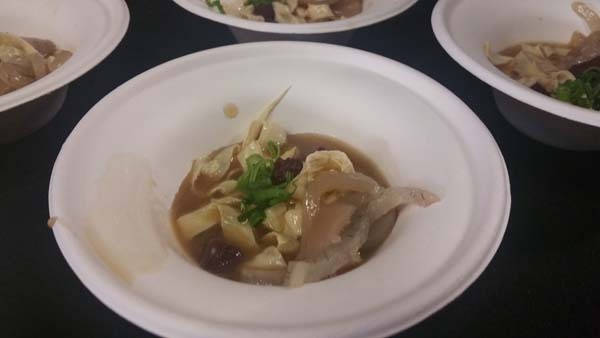 And then there was a pork dashi with cubes of either liver or blood and very thin translucent pork skin (at least we think it was) which was deliciously rich and subtle. Rogelio Garcia of The Commissary got a Large Black pig from Massa Natural Meats. Large Black pigs are native to Great Britain and known to make outstanding bacon. Chef Garcia was formerly chef de partie at Thomas Keller’s, The French Laundry as well as a number of notable restaurants in the Napa Valley. Chef Garcia wrapped bacon around a pork loin and cooked it to perfection. Mind you, he had only a week to prepare this dish and that includes curing the bacon. 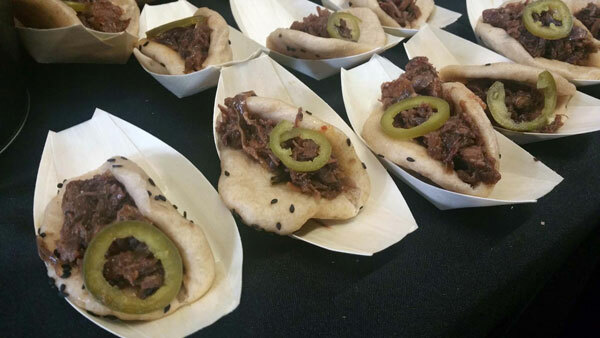 He also made a pulled pork sandwich wrapped in a steamed clam shell bun traditionally used in Cantonese cooking for eating Peking roast duck. It was wonderful. After eating more than a dozen different dishes, I finished up the meal with several smoked cocktails before heading outside to watch John Stewart and his 13 year old daughter Mackenzie Estes-Stewart in the butchery demonstration. Alongside them was the famous, Dave Budworth, the butcher from Marina Meats who is well known for winning butchering competitions. Laiko and I marveled at his Flintstone chops that he was carving up. A Flintstone chop is a bone-in rib eye with the short rib still attached. I’ve seen the beef version at Belcampo but never a pork version of the cut. I introduced Harry to Duskie as “my boss’s daughter”, which of course, tickled her because Duskie is so famous that no one introduces her like that now. Duskie Estes has appeared on The Food Network multiple times on multiple shows and my former “boss”, David Gelfand, couldn’t be any prouder. Duskie explained that she and her husband won the Grand Cochon in 2011 and were crowned queen and king of Porc, after winning two rounds of competition. For a moment, she nodded her head in a way that reminded me of how her father nodded to us scientists when making a point. Her daughter, Mackenzie was dressed up as a butcher. She wore a belt made of chains and suspended from the chains were several knives tucked into a metal box. 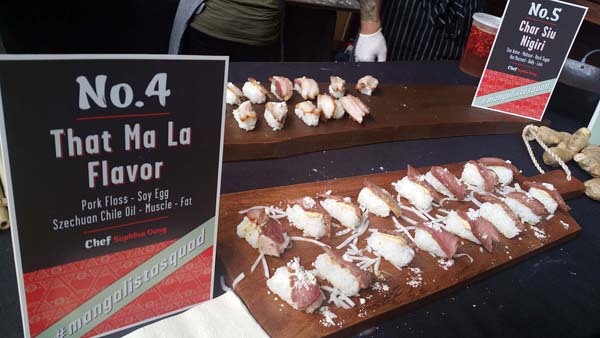 Cochon 555 was my first time and it was an amazing experience. After judging was done, the winner was . . . Paul Piscopo of San Francisco BBQ Kings and Ken Tominaga Pabu SF at the San Francisco Cochon Heritage BBQ 2016. 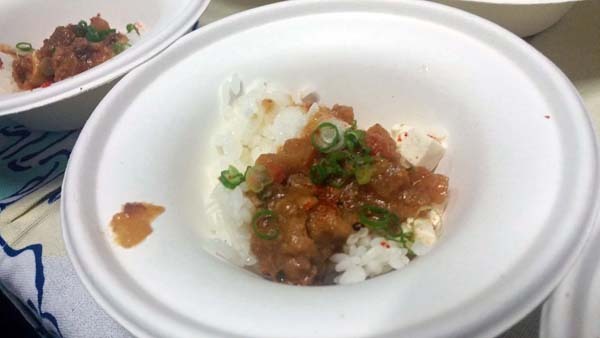 Their red miso braised pork was the signature dish. If I could have wished for one more aspect that I didn’t experience as a cook it would be the chance to listen to what the chefs were thinking when they approached their dishes. There are many aspects that one has to consider when planning a menu for an event like this that go beyond how many and how much. The family farming sensibilities and cultural inheritance were two aspects. But there is also something meaningful in how Brad Lowe describes barbecue as a context for hospitality. Because in the end, it is just that. We cook barbecue so that we can share our food, our inspirations, and ourselves.